As we peruse the International Design Excellence Awards (IDEA) product design awards for 2017, we are awestruck at the ingenuity that has us saying over and over again, “why didn’t we think of that?”. From sustainable products to throwback redesigns and a plethora of gadgets connected to the IoT, this year’s batch of gold, silver and bronze winners encompass international greatness in product design. Here are some of our favorite design awards from 2017 and how they correlate with consumer product reviews. Featured in the consumer technology category, these earbuds were lauded for their fitness-first perspective. They have internal storage so no smart phone is needed for some of the features like playing workout music, monitoring heart rate and guided fitness coaching. Tap controls allow for a variety of functions without the need for a smart phone or other device in-hand. Go Phone-Free – To listen to music or workout without your phone, simply upload music from your phone and track fitness variables. While most admitted to almost always having their phone on them, nearly all reviewers loved the ability to listen to music without using their phone. Tap to control – play music, skip tracks, adjust volume and answer a call with a series of taps. Most found the touch controls to be “awesome” and “amazing” but some thought they were “a bit rough”, finding that they were finicky. Built-in fitness coach – detects pace, logs time, distance and calories burned and prompts fitness guidance. Very few reviewers mentioned this feature, noting that most serious runners already have a method for tracking those items on their smart phone. The internal storage is a huge bonus for users of these headphones, so Samsung is right on track there. The tap controls are greatly desired but need some work. And Samsung should do a deeper evaluation of user feedback to assess whether marketing these to a fitness audience is the right choice. The latest version of the game console touts 4K video and streaming and HDR imaging capabilities. With up to 2 TB of internal storage and the ability to play old games as well as new, everything you need is available in a single box. The console is 40% smaller than its predecessor, and boasts over 100 console-exclusive games. The accessories for the Xbox One also got an upgrade, with the controller featuring a textured grip and enhanced comfort. Over 1,300 Games – play games from the past, present and future with 1 to 2TB of storage. Users liked the fact that they could play older Xbox 360 games as well as the reduced need for an external hard drive due to storage capacity. High Dynamic Range – richer, more luminous colors with high contrast between lights and darks to bring out the true visual depth of games. While reviewers liked the HDR feature for streaming and blu-ray content, it was noted that not many game creators have HDR visuals yet. 4K Streaming – Stream movies and television in stunning HD detail. This was a highly valued feature of users, with Netflix, Hulu and Amazon Prime topping the list of streaming services. Gamers rejoice! True gamers love the ability to play old and new games, so Microsoft is spot on in pushing this feature up front. The HDR visuals were also a plus, but Microsoft may consider incentivizing game manufacturers to get up to snuff quicker so that this feature is more apparent. Streaming is a huge reason customers purchase the Xbox, and the 4K speed is well received. The Switchdriver is renowned for its user friendliness and ease of use. Other than its light weight, the primary benefit is that there is no need to switch out drivers and drill bits because both of them are in it and can be switched instantly. It comes with an extra battery and a built-in LED light for visibility. At just over 3 pounds with the battery, this is one of the lightest drills on the market. Torque control settings help prevent damage by over-drilling. Rotating dual chucks – get work done twice as fast with half the hassle by instantly switching between driver and drill bit, since both are included. All reviewers glowed about this feature but many criticized the inability to use “regular” drill bits as they are not compatible. Battery benefits – Two batteries are included for convenience. With the 20V Power Share platform, you can share batteries with the other WORX tools you already own. Reviewers glowed about the battery life and ease of installing the battery. Several comments about the battery sharing program as well. The only criticisms were around how complicated it seemed to follow instructions for charging the batteries optimally (the charger does not automatically turn off). Lightweight – At just 3 pounds with the battery, this is ideal for those who can’t or don’t want to handle heavy duty power tools. While low weight appears to be a primary reason for choosing this drill, many reviewers noted that it wasn’t heavy duty enough to handle big jobs. While the star rating average indicates a favorable outcome, nearly all reviewers had some constructive criticism for this manufacturer. 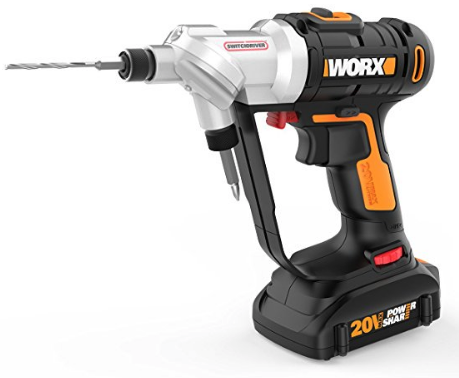 The folks at WORX are getting a lot right, but they should consider adding an option that allows users to use their own drill bits. The product development could also look to simplify the battery charging protocol. As for the light weight, if the drill can’t handle heavy duty jobs, they should adjust their target market accordingly. Smoke is a hot topic for foodies these days, and the Smoking Gun allows cooks to infuse smoke into a variety of foods effortlessly in their own kitchen. Everything from butters, cocktails and desserts to marinades, meats and dips can be smoked for a delicious flavor. The company promotes ease of use as the primary benefit of this device for home chefs. Effortless – simply load your wood chips, light it and blow smoke into your container of choice. Reviewers agreed. Not only is it easy to load and use, but controlling it is a breeze. Options – The options for what to smoke and how to smoke it are varied. From applewood to hickory, smoke everything from cocktails to cheese to add extra pizzaz to your next recipe. Users are having lots of fun with this gadget and they absolutely love all the options. The only criticism is that it may make your kitchen smell like a campfire, so some reviewers recommended using it outdoors. Quick – the company really wants users to know that this won’t be a big process. The steps to smokey deliciousness are quick and simple. While very few reviewers mentioned this as a benefit, those who did did so it favorably. Users love this product, and they’re having as much fun with it as the designers imagined. The most common complaint was around the smell lingering in the kitchen for a day or two. Breville may consider manufacturing some special smoking containers that resolve this, or at least putting a warning of the issue on the packaging. Other than that, very few reviewers complained about quality and longevity of the product, which should be looked at more deeply by the manufacturer. Many of Polaroid’s market advantages remain the same today: everything you need to snap and print photos in one device. But the Snap Touch offers many upgrades over its predecessor. It’s much more compact than the old version. It features a 3.5 inch LCD touch screen, a timer and selfie mirror, video recording capability and internal storage. Beyond that, the device claims to take brilliant images with its 10 megapixal sensor. Touchscreen – sleek feature mimics that of a digital camera, allowing preview and edits to photos before printing or sharing digitally. Users say the touch screen is not as easy to use as modern ones. More force is needed and there is no zoom feature. One user said the screen was “like an early 90’s video game”. Socialize it – use the editing features to get your photo just right, and then the app to easily share it digitally. The ability to save images and edit them before printing or sharing digitally is one of the best features, according to reviewers. High quality – with the user of Zink technology, full color, high quality photos can be printed effortlessly. HD video is also touted. This is one area where users often disagreed. They say that these photos are not high quality, the color is off, and the video option has no stabilization feature, resulting in a shaky video. Reviewers took issue with some of Polaroid’s claims for this camera. Polaroid should take a serious look at whether adding a mediocre touch screen is worthwhile or if users appreciate the “old school” simplicity without it. Users do love the editing features, however, via both the app and the touch screen. But the photo and video quality leaves something to be desired. Polaroid should dive deeply into its user feedback to make decisions on a path forward for this award-winning product. These product designers know how to create award-winning products that users love. But as the above results show, there is constructive criticism to be found, even within the most glowing product reviews. And while many companies claim to be “consumer centric”, this is often a high level buzzword that doesn’t have real outcomes. The small stuff—the battery charge being complex or the touch screen not having a zoom feature—can be the most memorable to a consumer. Addressing these issues head on will go a long way in a brand’s quest to create a lasting relationship with customers. But sweating the small stuff doesn’t have to make your life difficult. While our high-level review insights above can help highlight some issues, it would behoove product designers to instill an ongoing product review monitoring program to incorporate the post-purchase feedback into its customer-centric strategy. A partnership with the right entity can provide award-winning insights that prove true with both design entities and consumers themselves.